Back in August 2008, I attended the Whitefish Wine & Food Summit at Whitefish Mountain Resort in Montana to participate in the “White Fish and White Wines on the Mountain” tasting. On a Friday night, a few winemakers in attendance paired their favorite white wine offerings with various renditions of white fish. I was working for Adelsheim Vineyard at the time, and brought a handful of beautiful white wines for the event – highlighting the elegant 2006 Caitlin’s Reserve Chardonnay. 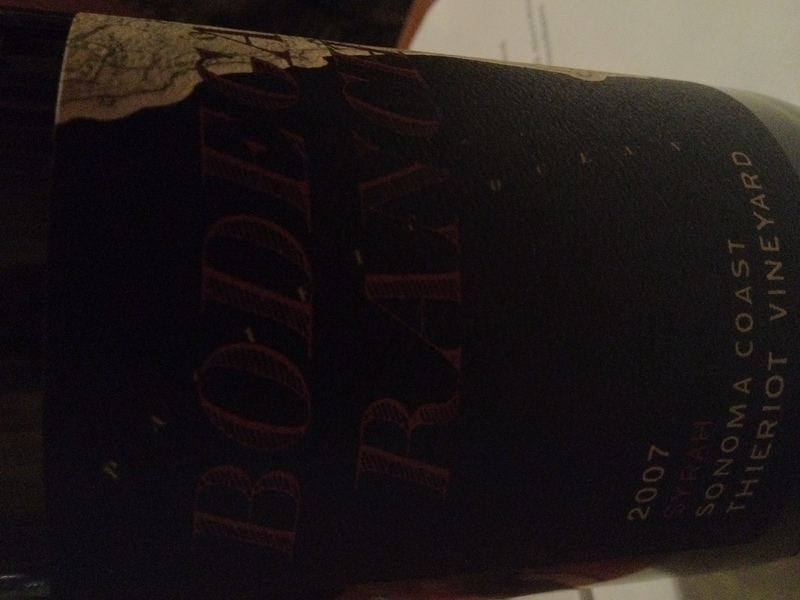 lively discussion about clones, sites, ripeness, acidity, richness, oak – you name it. I was mostly impressed by something interesting that Kenneth Volk was doing in the Santa Maria Valley. He discussed his single vineyard Chardonnay program. I was unaware of any American winemaker doing this kind of project with this varietal. I’m sure there were others out there making a handful of single vineyard Chardonnays in California, but certainly not with this scope of attention and intention. Each single vineyard wine was produced in a distinctive way, depending on the site and, ultimately, the ripeness and acidity of the fruit as it arrived on the crush pad. Decisions for whole cluster vs. destemming, barrel fermentation regime, etc., were based on each vineyard’s individual need. For example, his then 25-year old small block of own-rooted Wente clone Chardonnay from his KVV Estate Vineyard wine underwent barrel fermentation in French oak and frequent rolling of barrels in his OXO rack system. The OXO rack system allows for rolling the barrel in place to distribute the lees into suspension throughout the barrel without having to remove the bung. This lessens the oxygen pick-up in the wine, and preserves delicate aromatics while moderating the extraction of oak. Over time, this process imparts a creamy texture to the wine and a seamless integration of wine and oak. 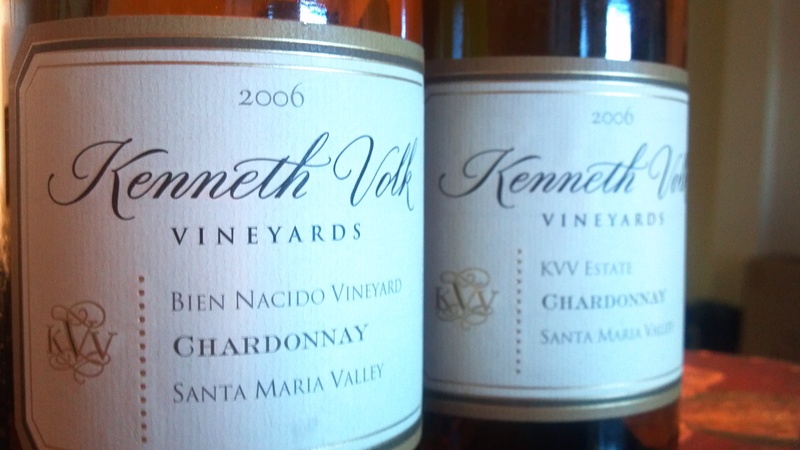 The Kenneth Volk Chardonnay portfolio now consists of vineyard designates from Sierra Madre and Bien Nacido Vineyards, and a Santa Maria Valley appellation blend. Back in 2008, no one was doing anything like this in Oregon. I thought it would be amazing for someone to introduce a focused, single vineyard Chardonnay program in Oregon. The problem was, it’s hard enough to get consumers to understand and embrace single vineyard Pinot Noir, let alone Chardonnay. Thus, a Chardonnay single vineyard program has yet to really emerge. With so much emphasis on the state’s popular Pinot Gris, there is still a lot of work to do to celebrate and promote the elegant, distinctive Dijon clone produced Chardonnays in the Willamette Valley and beyond. I had hoped to convince my then employer to consider commencing a single vineyard Chardonnay program. Alas, it wasn’t the ripe time. I had exchanged business cards with Mr. Volk and wrote him about his program out of earnest interest. A couple weeks later, I received an unexpected shipment of his entire 2006 Chardonnay portfolio – about 6 wines. Such generosity! I was over the moon and was excited to share these wines with my wine loving friends. I still have two bottles left – the Estate Vineyard and the Bien Nacido Vineyard (which means “Good Birth”). These are superb winter whites – with natural acidity that would complement any cream reduction dish. I’m inspired by February’s 29 Days of Chardonnay to pull the cork, grab a fork and delight my way through the final two. What will be on the menu? I’m thinking some white fish – maybe crab – and perhaps a creamy Carbonara. All with a toast to Ken Volk! Leah Jorgensen is a wine maven with a great laugh. She is a communications expert who has worked in the wine industry for over a decade. She consults for several wineries and writes about travel, wine and gluten-free living. LJC Wine Co. LLC is Leah Jorgensen Consulting, specializing in wine industry marketing and communications strategic planning, implementation and coaching. Leah is also a winemaker, and Leah Jorgensen Cellars is her wine brand inspired by the Loire River Valley made from grapes sourced from Washington and Oregon. See her full bio here, and more information on what she’s up to can be found on her main web site. She is on twitter @LeahJorgensenOR and lives in Portland, Oregon. Aromas are reticent and lifted, peppered blueberry, black raspberry, blood orange, bitter cocoa, violet and lilac and apple wood with a briny, sweet rubber underbelly. Very elegant and humble. The acidity is tremendous though the structure leaves me looking for a bit of weight in the middle, it ends with espresso grip. The wine is sleek and nuanced up front and without huge hits of alcohol or overripe fruit. Black pepper, red plum and blood orange flavors are prominent as are floral, sage, hay, black olive, soft cured wood and chalky notes. The finish is briny and grainy, chalky and the persistence is very good. The wine picks up more spice, weight and structure in the glass with a few hours of air. Its opens like a sinewy and spicy and finishes with more pronounced structure and weight, though it remains very lithe with a beautiful peppered blood orange character. Primary and bright at this point, it should be more complex in 3-5 years. Sandy soils in Petaluma Gap. 135 cases, 13.5%.